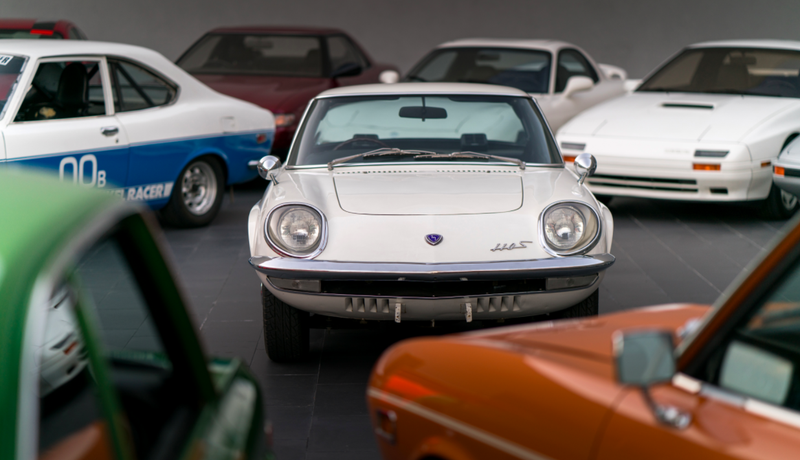 Fifty years ago today, Mazda sent a shockwave through the industry by offering for sale the world’s first rotary powered sports car—the beautiful and futuristic Mazda Cosmo Sport 110S. Despite its lackluster sales, the Cosmo set the stage for rotary engine use in the automaker’s lineup, and what resulted are among the most delightful cars ever created. After developing the rotary engine as a teenager, German engineer Felix Wankel eventually went on to develop airplanes for the German government, and later to work for German car and motorcycle company NSU. In 1959, NSU invited 100 execs from auto companies around the world to see his invention. Among those executives was Mazda’s (at the time called Toyo Kogyo) president, Tsuneji Matsuda. Tsuneji Matsuda—the son of the man who turned Mazda from a cork company (yes, for use in wine bottles) into a car company—needed a way to make his company stand out so it wouldn’t be forced to merge with other Japanese car companies at the time. The rotary engine, he thought, could be the answer. As soon as he saw Wankel’s creation—which promised a small package, a lightweight design and lots of power without wasting energy turning reciprocating motion into rotational motion—Matsuda fell in love. In fact, Ben Hsu says in his book Classic Japanese Performance Cars that Tsuneji Matsuda became so obsessed with what he saw at NSU’s event that he bet the farm on the technology, licensing it from NSU and Wankel in 1961, and putting engineers up to the task of getting the rotary engine reliable and ready for production. It was a tall task. According to Mazda, within an hour of running the first prototype engine at the headquarters in Hiroshima, the motor seized. Even when they could get the thing running, Ben Hsu says in his book, the tips of the rotor kept scoring the combustion chamber walls. Kenichi Yamamoto, the chief engineer at the time, assembled a group now known as the 47 Samurai to whip the rotary into shape. Ben Hsu says that Yamamoto solved the scoring problem one day with a “Eureka moment” as he was writing with a pencil. That day, he noticed the “glossy luster of his writing instrument” and decided to use graphite as an apex seal to seal the combustion chamber without ruining the inside of the engine surface. In the end, the team had a reliable, lightweight, rotary motor with two 0.49-liter combustion chambers, all fed air from a four-barrel carb. Total output was about 110 horsepower at a ridiculously high 7,000 RPM. That small size let the designer—Heiji Kobayashi—go crazy and design one of the most futuristic, incredibly gorgeous cars in history, the Cosmo Sport 110S. The company ended up building 1.99 million rotary vehicles, including sports cars, buses, and even the Mazda 787B race car, which won the 24 Hours of Le Mans in 1991. And even though Mazda hasn’t produced a rotary-powered car since the RX-8 went away in 2012, the cars shown above, which were all graced with the quirky little rotary engines, will forever live on in the annals of automotive history.